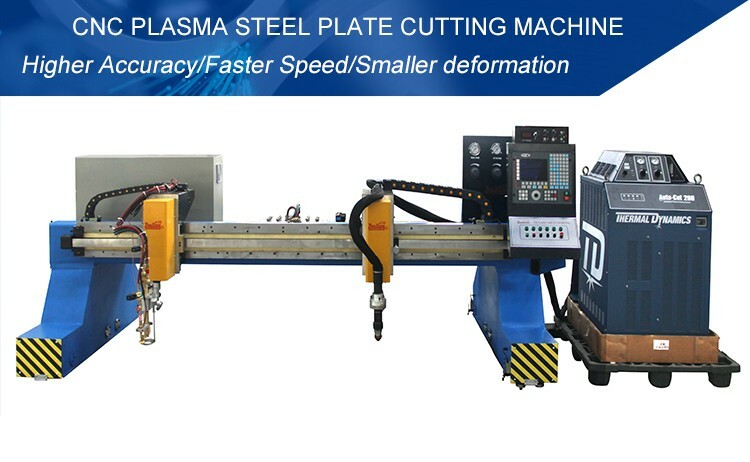 This series of plasma cutting machine is a high efficiency and high performance equipment, which uses gantry type, single drive or double drive. This machine uses advanced CNC system from abroad, such as Spanish FAGOR and American Hypertherm. Its excellent cutting parameters, reliable and stable features ensure the perfect cutting effect. CNC flame/plasma torch has auto height regulator and auto ignition functions, which is convenient for use. it features compact structure, light weight, good rigidity, small deformation and artistic appearance. servo driver and motor which drives Japan SHIMPO reducer through rack-and-pinion gearing. precision machining and accurate grinding racks are installed outside the guide way. ensure the longitudinal straightness and parallelism of rail. Above are our standard model, it can be designed and manufactured according to customer's request. CNC system: Beijing STARFILE, Spanish FARGO, American Hypertherm is optional. Use Japan Panasonic AC servo drive and Japan SHIMPO reducer. Automatic igniter and height controller of torch with convenient operation. Backfire arrester equipped on the torch to prevent the safety hazards. Brand of plasma power: American VICTOR or American Hypertherm.